Congress president Sonia Gandhi today set the tone for the upcoming Lok Sabha elections with a twin attack against Pakistan and the BJP even as she urged party cadres to propagate the UPA government�s achievements in their poll campaign. Congress general secretary Rahul Gandhi on Sunday made a strong pitch for giving more representation to youth in electoral politics. 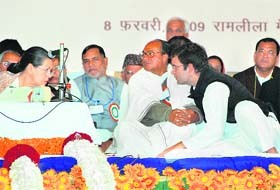 UPA chairperson Sonia Gandhi and Congress general secretary at a party conclave in New Delhi on Sunday. The CPM, which led the Left Front�s withdrawal of support to the UPA government on Indo-US nuclear deal, has not ruled out supporting a secular government in which Congress may be a part but not leading it. Has the Satyam fraud shaken your confidence in Indian IT firms? Read how Homeopathy treats chronic diseases permanently and without any side effect. The Bharatiya Janta Party (BJP) wound up its three-day national executive meet held to chalk out a strategy for the forthcoming general elections here today, but without reaching on a conclusion whether the party would revert to its pet plank of Ram and Ram Mandir or stick to terrorism. INDIA is caught in an unwelcome situation at present, almost in a dilemma about what it should do to come out of it. While the present is weighing heavy on its mind, the uncertainty about the future is worrying. Clean water was made available to nearly 1,500 residents of this village yesterday after years of drinking polluted underground water courtesy the Budda Nullah. 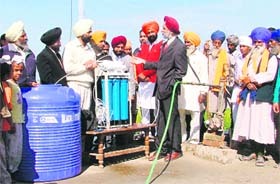 NRI Joginder Singh shows a community water-purifying system installed at Khurshidpura village in Ludhiana. DELHI: Where will visitors stay? 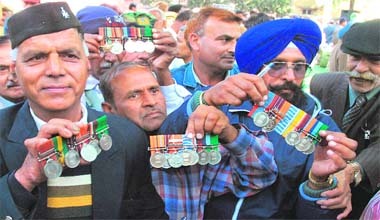 Peeved at disparity in pension between the same rank personnel and the Union government�s inability in addressing the issue, a large number of ex-servicemen today returned their bravery medals to President Pratibha Patil, the supreme commander of the defence forces. Former Chief Minister Amarinder Singh was today quizzed by a team of four high-profile Vigilance Bureau (VB) officials at Moti Bagh Palace here in connection with the Amritsar Improvement Trust scam.